For my birthday this year I made a cherry cheesecake so I could have as much cake as I wanted. 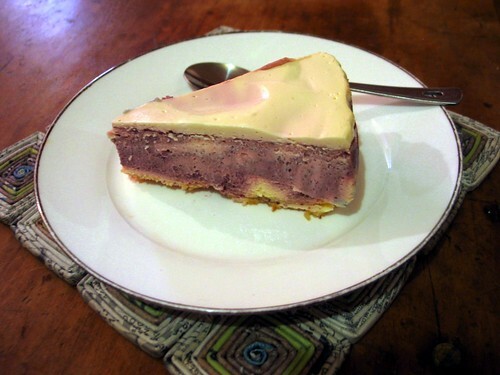 I based the recipe off the London Cheesecake in Nigella Lawson’s How to Be a Domestic Goddess. I’ve made this cake several times, with various modifications and it always works out well. This cake has an hour in the oven, plus it needs to be refrigerated to fully set, so I usually make it one day ahead. The first modification is to use almond meal for the base instead of crushed biscuits, this is a quick and easy way to make a gluten free cheesecake base. Put almond meal and butter or oil into a frying pan on medium heat. Stir together, and move gently around the pan so that the almond meal toasts evenly. Once it is a nice golden brown, turn off heat. The trick to this cheesecake is that it baked in a water bath. Grease a spring-form pan and line with baking paper. I cut the paper into a circle a bit bigger than bottom of the pan, and use strips of paper to line the sides. Unlike other cakes, I like to set up the pan so that the paper is sticking out where the bottom and the sides meet before using the spring to clasp everything together. Then wrap the outside of the pan in two big sheets of aluminium foil. I scrinch the foil over the top edge of the pan to keep it in place, and cross the rectangles of foil over each other to make sure there are no gaps. Press the toasted almond meal and oil into the bottom of the pan to make the base and refrigerate. Pre-heat oven to 180ºC or 350ºF. Beat together the cream cheese, sugar, and vanilla, and add in the eggs and egg yolks one at a time until you have a thick and smooth consistency. This is the basic cheesecake filling. Nigella adds in some lemon juice at this point, but because I’m modifying the recipe to make it a flavoured cheesecake, I skip it. In a blender or with a stick mixer puree the cherries and sugar with one third of the cheesecake mixture until smooth and evenly mixed. Bring out the pan and pour half the remaining plain mixture over the base. Then alternately spoon in the cherry mix and the plain mix and swirl together to make a marble effect. The plain mix will be thicker than the cheery mix, which is why it is good to start with a layer of plain. Place cake tin into a large and deep baking pan, and the fill the baking pan with water so that it comes about halfway up the sides of the cake tin. Place on middle shelf of pre-heated oven and bake for 50 minutes. After 50 minutes, the cheesecake will have gelled, but still be a bit wobbly* when you bring it out. Gently spoon over the sour cream topping until it is evenly covered, then return to oven for addition 10 minutes. When the time is up, remove from oven and carefully remove cake tin from the water bath. Place entire tin, foil and all, on a cooling rack. When it is cool enough to touch, you can remove the foil. Once the cake has cooled, cover and refrigerate. When you are ready to serve, release and remove the sides of the spring-form pan. If, like me, you are making this for eating at home, you can leave the cake on the base of the pan and serve directly off that. If you have a special occasion, this is where the extra baking paper comes in handy. remove paper from the sides of the cake, then very gently lift the paper up around the edges of the base, and holding onto the paper, slide the cake onto a serving plate.